Echinacea, used in tincture, strengthens our immune defenses. On the one hand by increasing the number of white blood cells in circulation, the other by improving their attack strength (ability to phagocytosis). The army is larger, and the soldiers are better equipped! However, clinical studies have reported two types of results: those that prove its effectiveness and those who are not conclusive. Looking more closely, we realize that in fact echinacea is very effective if your immune system is deficient, following chronic stress, lack of sleep, poor diet or lack of vitamin D, among other examples. 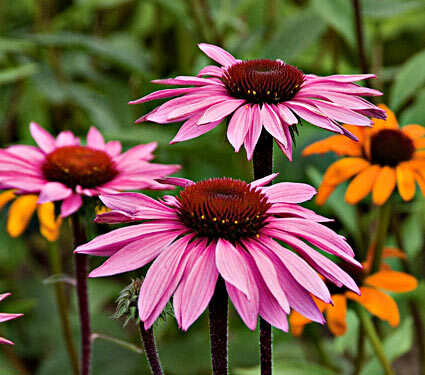 If you are in this case (you often catch a cold), echinacea reduce the duration and intensity of infection. However, if your immune system is already turning round, the role of echinacea remains more marginal. This is why I find echinacea particularly effective for infections, and less in prevention. It then takes the at regular intervals, every three hours, for example, because of a tincture teaspoon in a little water, knowing that we will be limited to c ive teaspoons per day. You start at the first symptoms and continue throughout the duration of the infection. The European Medicines Agency recommends to reserve the use for adults and children over 12 years. In this case, if the child weighs between 30 and 50 kg, do not exceed half a teaspoon per outlet. Beyond 50 kg, a small teaspoon suffice. Among the medicinal echinacea, three are particularly widespread: the purple coneflower (Echinacea purpurea), the most majestic and easier to grow; Echinacea angustifolia (Echinacea angustifolia), small size and difficult to tame, but considered by Americans as the most powerful; Finally, pale coneflower (Echinacea pallida), thin but strong, a compromise between the two. The key to germinate your seeds is the cold stratification. The easiest way is to place the seeds in February in a little soft, damp sand in a plastic bag in the refrigerator for six weeks. Then take out your seeds and plant them in the tray to March or April depending on your region. Space the seeds of 5 cm, and keep the soil moist by using a vaporizer. We can also make outdoor stratification. Once the seedling has three or four leaves, you will pass the bucket, and then in the ground when it is strong enough. You can plant E. angustifolia tight (spaced 20 cm), and E. pallida (a little less than 30 cm). Leave more room E. purpurea because its air mass is impressive (50 cm). The coneflowers are beautiful and easy to grow. Leave them in the sun. Once mature, water them occasionally, but not much. Give them a normal soil, not too rich. They grow in very harsh conditions in certain US states (Nebraska, Kansas). A little water, a little manure and compost, and your garden will appear to him as a little paradise. The root is the part used. Wait until your plants have 2 or 3 years, especially E. purpurea. Then harvest in autumn, when the ground is soft, after a rainy day, for example. The roots of E. purpurea are organized into a thin, dense network. The roots of E. pallida and E. angustifolia are thicker and more scattered, and I find them easier to handle. Spend the roots with water to bring down the bulk of the earth. Then start to break the root mass into small pieces. Wash and brush each piece. The goal is to remove all the earth, which can be laborious to E. purpurea. For the preparations of echinacea dry, cut the roots into pieces and dry them.